The Tree of life concept appears in science, philosophy, religion and mythology and alludes to the interconnection of all life on our planet, serving as a metaphor for our common descent. It is a symbol that appears in nearly every ancient culture. With the branches reaching for the sky, and deep roots into the earth, it dwells in the three worlds of heaven, earth and underworld, acting as a link among the three. In Indian textiles, the tradition began to be associated most significantly with palampores or bed coverings, featuring a central flowering tree growing from a rocky mound or arising from water surrounded by sacred lotuses and marine creatures. In this form the motif of the tree was surrounded by vases, animals or birds and the design included a series of narrow and broad borders of undulating patterns based on flowers and leaves. 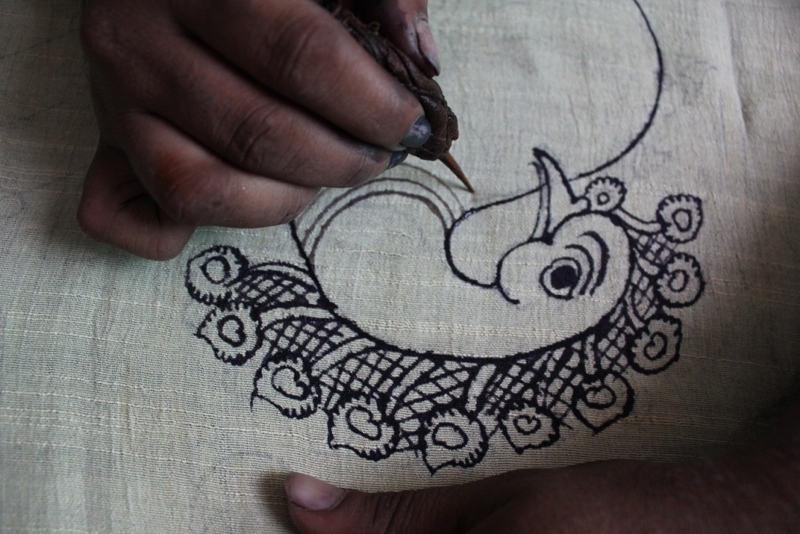 Each palampore was hand-created with natural dyes creating unique designs, which made it exclusive to only the wealthiest classes. The early tree of life designs featured animals, peacocks and trailing flowers. The motif has since been adapted to several art forms and fabrics, appearing in distinct interpretations in Mata Ni Pachedi art, Gond Paintings and even modern home decor. The elongated motif of the Tree of Life is also woven on the shawls of Kashmir. Among the many textile interpretations of the Tree of Life symbol are the Kalamkari (hand-painted) textiles, where the Tree of Life motif makes a common appearance in 17th – 19th Century cotton fabrics produced in Masulipatanam, Andhra Pradesh. The ancient symbol continues to be re-created with modern textures and nuanced interpretations that highlight the continuity, connectedness and seamless beauty of nature and life. Posted in Art, Crafts, History, Textiles and tagged Culture, Gond Painting, Kalamkari, Painting, Religion, Symbols, Textiles, Traditional, Tree of Life. Bookmark the permalink.